W.8_Lilly Wasitova_Gold Price as Stable Reference Value? Using the data for the average Year 2011 Price from  to be compared to the extrapolated value of 2011 gives us the comparison as per below table and a difference of 5.84%, which makes the extrapolation value good enough to be used as reference. 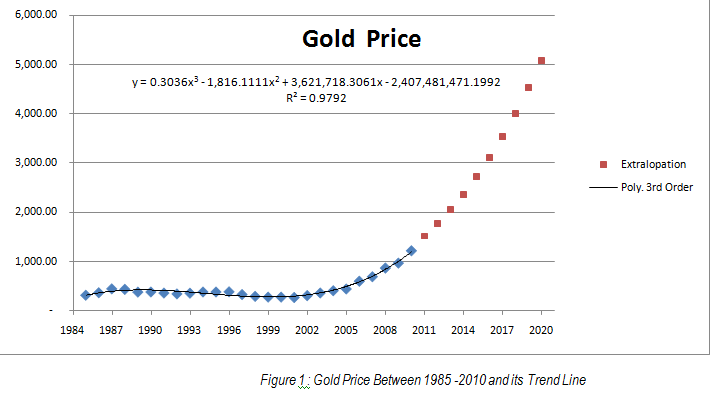 From the calculation, it is showing an over 10% increase every year that makes unbelievable figures that needs further study on how the market will response to this kind of future Gold Price prediction, since this will affect not only the cost of living showed in this case study but also in all aspect of living and trading. This entry was posted in Lilly Wasitova, Week #8. Bookmark the permalink. 1 Response to W.8_Lilly Wasitova_Gold Price as Stable Reference Value? For ANYONE doing estimating into the future (and by definition, aren’t all projects planned into the future?) this is an ESSENTIAL skill set to master. And actually, you could do a follow on analysis (another posting) of what is likely to happen to the EURO (and the dollar!!) vis a vis the RUPIAH!!. Folks, what I am trying to teach you here (“Applied Engineering Economics”) is so essential that I believe it to be a life skill- that is it should be taught in high school as well as a required course in all university programs. Why? Because the fundamentals impact each and every one of us in our daily lives. Keep up the good work, Bu Lilly and now as the Program Manager and trusted leader, you need to drag our “resident Bule” along!!! The strong help the weak! !